Follow all the steps below to register your workers as contractors for the Garden Island Bayinguwa Delivery Team (GIBDT) on the Garden Island (East) Stage 1 Project. We suggest you read through the steps before you get started, and allow yourself time to source and upload the information about your employees who will work for the GIBDT on this project. After each worker completes the required online inductions, you will register them in Lendlease Site Access, which is managed by Pegasus. A nominated administrator from your business will be required to complete the steps below. Please note: you should only follow the compliance process if you have been requested to do so by the GIBDT. Please ensure you have selected the correct project or site to avoid delays in your approval. User guides with screenshots can be found on the FAQs and Documents page. If you need help during Lendlease Site Access registration, please contact the Lendlease team at Pegasus. Each worker accessing the Garden Island (East) Stage 1 Project must first complete an online Defence Bases induction. 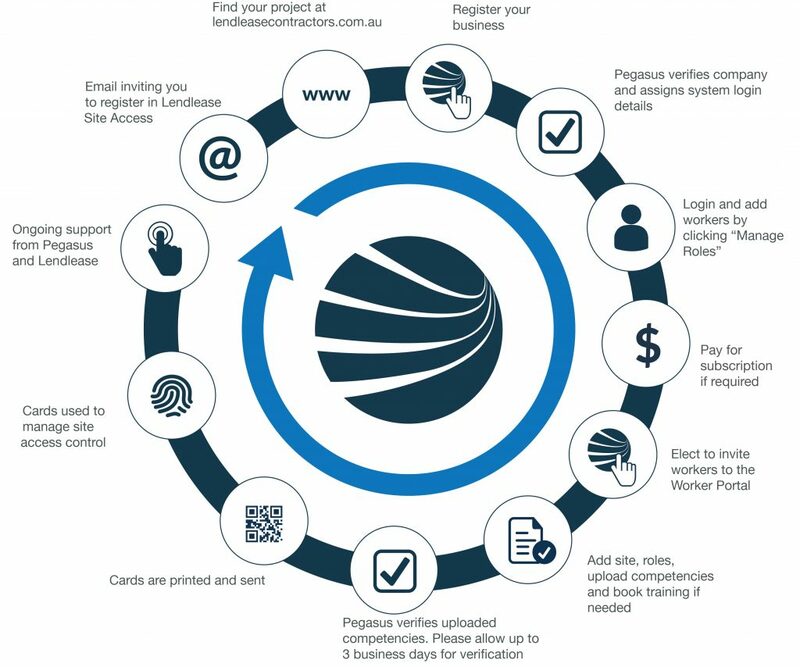 At the end of this induction, the worker must supply you with a screenshot or printout of the confirmation which you will load against their profile in Lendlease Site Access. They must also have this proof on hand to present to security at site. Next, book your workers into the Lendlease Orientation – Part A – Engineering and the Lendlease GMR Passport – Stream 5. Workers must successfully complete these online inductions and supply you with the digital certificates they receive. You will upload a copy of the certificates in Lendlease Site Access later in this process. Lendlease recommends using Google Chrome to complete these inductions. The next steps are to add your workers so Pegasus can verify their compliance to work on the Garden Island (East) Stage 1 Project. With your workers entered in the system, you can pay for their registration and order their ID cards to work on Garden Island (East) Stage 1 Project. Worker registration costs $40 + GST per person which includes the management of roles, verification of documents, supply of card (plastic and eCard) and first year’s subscription. Annual subscription renewal costs $20 + GST per person, and replacement cards are $20 + GST. A tax invoice will be supplied on payment. With your employees now registered in the system, you must next select their name to Add New Role and choose their role on this project, labelled 17. Garden Island (East) Stage 1. It is also mandatory to choose the trade or task role the worker was recruited for on this project (e.g. operator – excavator, electrician, etc.). Your selections here will determine the competency documents (e.g. licences or tickets) you’ll be required to upload in the system to prove your worker’s qualifications to perform the chosen role/s. You will also be required to upload their online induction certificates, which they must provide to you at the beginning of this process (Step 1 and Step 2). Pegasus will validate the documents you’ve uploaded for your workers during registration. You’ll be emailed if there are any issues and given a chance to update the information. Upon document approval, the roles will be applied to your workers and their access ID cards printed and sent to site. Worker eCards will also be sent to their mobile number, but can only be used for site access when profiles are verified and the site-specific induction is completed. It’s important that you keep details up to date, so you’ll be emailed if any documents are expiring so you can update them in the system. You may also elect to invite your workers to the Lendlease Worker Portal, which allows them to manage their own profile. Visit the Worker Portal page for more information.